1. 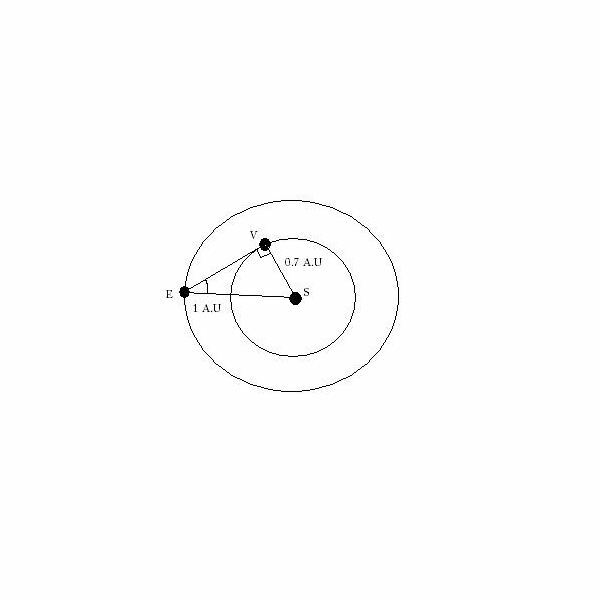 The orbits of Venus and Earth can be assumed to be circular with same center (the Sun) and in the same plane for most practical purposes. 2. The distance between the Earth and Sun (Radius of Earth's orbit) = 1 Astronomical Unit or 1 A.U. 3. The distance between Earth and Venus (Radius of Venus's orbit) = 0.7 Astronomical Unit or 0.7 A.U. Let Venus and Earth be in such a position that EV is the tangent to the inner circle (Venus's orbit). Let us calculate the angle VES. Thus, angle VES is approximately 44 degrees. We have derived that the maximum Sun-Earth-Venus angle can be a maximum of 44 degrees. Astronomically, this fact has an interesting implication. Whenever you see Venus in the sky, the Sun can be at most 44 degrees away in the sky. In daytime, Venus is not seen because the sun is too bright. Just before the sun has risen or just after the sun has set, Venus can be viewed at a maximum of 44 degrees above the horizon. We know that the Earth completes one rotation equivalent to 360 degrees in 24 hours. At this rate, 15 degrees are covered in 1 hour. Thus, it covers 44 degrees in less than 3 hours. Rotation is responsible for rising and setting of all heavenly bodies. Therefore, Venus can be seen only for three hours before sunrise ot three hours after sunset. This is why Venus is known as the morning and evening star. A similar calculation can be done for Mercury as a class exercise.